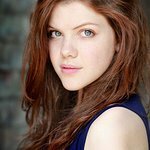 Georgie Henley is a British teenage actress best known for playing Lucy in the Narnia films. Henley wrote two books on the set of “The Lion, the Witch, and the Wardrobe” (2005): “A Pillar of Secrets” and “The Snow Stag.” She donated them to WWF. In 2010 Georgie lent her support to Operation Christmas Child's “Operation Narnia” campaign. In 2011 she submitted a doodle for Epilepsy Action's National Doodle Day. Google trends for "Georgie Henley"